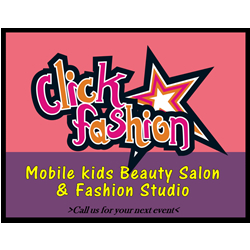 Click Fashion USA is a Mobile Kids Beauty Salon and Fashion Studio for Parties and Events. We bring to your event: Makeup, Face Painting, Fun hairstyles for girls and boys, Kids Spa and Nail Art. We provide all the material to make your little stars ready for a Hollywood Style Fashion show complete with Red Carpet and Runway instructions. Plus: Kids Disco, Party Decor and more… Let us make your party different, Fashion and Fun! Visit our website and facebook page. Ask for our price list and whole party package.